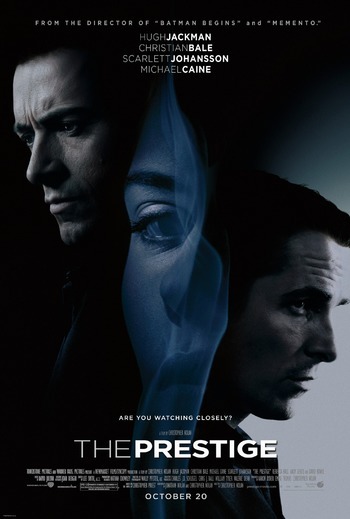 The Prestige is a 2006 film from Warner Bros. and Touchstone Pictures, directed by Christopher Nolan and starring Hugh Jackman and Christian Bale. It is based on an award-winning book of the same name by Christopher Priest. The story follows an escalating rivalry between two late 19th-Century magicians, Alfred Borden (Bale) and Robert Angier (Jackman). They started their careers as "voluntaries" to another stage magician until Angier's wife died during a performance, possibly because Borden may have tied a stronger rope knot than necessary (with the wife's permission). The rivalry extends into the magician scene as the two compete to see who is the best at their craft while sabotaging each other's acts. Using an Anachronic Order, the movie starts with the conclusion of the conflict: Angier drowns during a performance and Borden is incarcerated for murder. Then, through the framing device of the two men reading one another's journals, the movie goes back and forth throughout the story and reveals the secrets behind both men and how lives were destroyed by their obsession. Interestingly, The Prestige cannot really be said to have a central Protagonist. Both sides are portrayed neutrally without either being favored by the film's point of view. This gives a different slant on a story instead of just the normal protagonist vs. antagonist story. Instead we get a story about the conflict between two obsessed, flawed men. Also, this film has Nikola Tesla played by David Bowie. Now has a character sheet in need of expansion. This film is built almost entirely out of unexpected twists. You will learn them if you read any further. Angier is told that he needs to be willing to "get his hands dirty" if he wants to be a truly great magician, which in context meant being willing to kill doves to maintain an illusion. Borden actually does just that in an earlier trick. When Borden is performing his bullet catch, he asks if his volunteer is "man enough" to point a gun at him and pull the trigger. You have a little daughter, seven years old at the most. Imagine, years before, that you made a colossal mistake and killed the wife of your good friend, and now that friend is growing steadily more and more obsessed with getting revenge on you. Then your former friend is murdered, with you present. You are tried and sentenced to death, meaning your daughter is going to the workhouse. Until you get a lifeline - give up your most valuable secret to a rich benefactor, and he will take in your daughter and raise her. You do so...and it turns out the benefactor is the murdered man, who faked his death. That's right — your former friend has murdered you and kidnapped your daughter, where she will be in close proximity to a man who is clearly very unstable, and he's made sure you are absolutely helpless to stop it. Your spouse seems loving one day and irritated by you on another. You can't understand what causes them to switch between kind and unkind, and they refuse to change their behavior. Alternative Foreign Theme Song: "Returner" by Gackt was used as the theme song in the Japanese version. Always Identical Twins: Part of the twist. Alfred Borden is actually a pair of twins playing the same man. Ambiguous Situation: Angier and the audience have no way of knowing which of the doubles from Tesla's machine has the original person's consciousness. They're both exactly the same, so they both feel that they are the original. Anachronic Order: A Nolan trademark. The first few scenes of the movie are located at the last 25% and the very end of the story, and the movie then jumps back and forth between the first half and the second half of the story (using Tesla's lab as a mid-point), and then ends the story with new reveals. Aristocrats Are Evil: "Lord Caldlow". It's hard to decide if the character was always this way or slowly grew into it as the years passed. Alfred Borden is specifically sent by Cutter to observe another magician to uncover his secrets, and one of the ways he's Angier's Always Someone Better is because of his ability to observe and discern the method behind most of the tricks that occur, including Angier's original transportation trick. Later on, Borden is seen getting angry at someone for failing to uncover the last version of Angier's trick. That someone is the other Alfred, since they're twins, with the implication being that this brother, who also refuses to carry on the feud to its fatal conclusion, is the brains behind their operation. Badass Boast: Root has his moment when he displays himself as competent to perform as a double. Root: Yes, you'd drink, too, if you knew the world half as well as I do. Did you think you were unique, Mr. Angier? I've been Caesar, I've played Faust. How difficult could it possibly be to play the Great Danton? Beethoven Was an Alien Spy: Nikola Tesla Was a Wizard. He invented a duplication machine. Beta Couple: In a very unusual version of this trope, Tesla/Edison for Borden/Angier. Both couples are in the same lines of work, both are fiercely competitive and at the very tops of their fields. Black and Gray Morality: Have fun trying to decide who's gray as both main characters resort to increasingly questionable tactics through the course of their rivalry. Book-Ends: Michael Caine showing the bird trick to the little girl in both the beginning and the end. Interestingly, it's a bit creepier at the end because you know how it's done. The bird in the cage has to die. Definitely not played straight when Angier deliberately uses a real bullet to blow two of Borden's fingers off. Played straight when Borden was demonstrating the trick to Sarah, however. Byronic Hero + Villain Protagonist: The magicians. And the twin that is Jess's father is the only one to be cast in a better light than the other two. The other twin is a paranoid jerkass that drives his brother's love to suicide. Angier, on the other hand, is a Mad Artist so obsessed with revenge that he's willing to clone and drown himself dozens of times just to upstage Borden. Clarke's Third Law: Tesla's machine. Any sufficiently advanced technology is indistinguishable from stage magic. Classically Trained Extra: Angier's first body double, Gerald Root, had played many great roles, but is now a drunkard and a washed-up actor. Cloning Blues: Angier's clone is a perfect replica in every part from clothes to memories, created instantaneously. Of course he thinks he's the original, all the way until the next performance when he clones and unwittingly drowns himself. Cycle of Revenge: A vicious one, at that. Angier's wife died from an accident ambiguously caused by Borden, and Borden's refusal of explanation made Angier obsessed with beating Borden; the cycle of revenge became intertwined with their cycle of rivalry until both sides lose from their obsession. Both Angier and Borden were considerably more sympathetic in the book. Angier's new show after his return from Colorado is far grimmer than his original Large Ham performance as The Great Danton. He even does the trick that killed Julia. The Determinator: Angier and Borden. Angier killing himself several times is just psychotic, particularly since he never knows whether he'll be the man on the stage or the man in the box. Borden is nearly as bad, willing to have two of his fingers severed just to keep matching his twin. In-Universe, Angier is after the Transported Man trick simply because it'll make a great show, while Borden wants to try and push the limits of the art of magic. Arguably, the whole movie could be seen as a debate on the nature of art in general. Also present in the book where Borden's disgust at Angier is fueled by Angier being paid for spiritism sessions. Borden hates that Angier pretends to have supernatural skills because it's disingenuous but also because it undermines the actual skills needed for the illusions. Driven by Envy: Part of Angier's (initial) motivation, Borden has his wife and child while all Angier has is the memories of his dead wife Julia. Driven to Suicide: Borden's wife, Sarah. The Ending Changes Everything: Very much so. You will watch the movie a second time to see the clues you overlooked the first time around. Even Evil Has Standards: When Borden ( the jerkassy one that loves Olivia) sees Angier drowning in the box, his first reaction is to break the glass and yell at Angier to hang on. Evil Will Fail: The more absorbed the dueling magicians become in their vengeance-fueled-rivalry, the more their lives fall apart, until finally Angier's ingénieur abandons and betrays him when he crosses the Moral Event Horizon. Face/Heel Double-Turn: Angier starts out with the audience's sympathy after his wife dies and Borden just seems to be a Jerkass. But as the film goes on we start to see Borden become the sympathetic one as Angier slips even further into revenge. FaceHeel Turn: After the Face/Heel Double-Turn described above, Borden destroys audience sympathy by driving his brother's beloved wife to suicide to keep her from meddling in his own affair with Olivia. Fingore: Borden jamming Angier's harmless bird cage trick, causing a poor volunteer's hand to get crushed, then Borden losing two fingers, and subsequently his twin brother. Foreshadowing: Both major twists at the end of the film are foreshadowed pretty subtly. Starting with Borden immediately understanding the fishbowl trick, and the elaborate lie behind it. Borden saying: "He came in to demand an answer and I told him the truth. That I have fought with myself over that night, one half of me swearing blind that I tied a simple slipknot, the other half convinced that I tied the Langford double. I can never know for sure." He really did argue with "himself". And the pairs of birds of whom one is killed every time the trick is performed. "Today you've been the lucky one." And Sarah's nephew, when he sees Borden perform the bird trick, cries even when Borden shows him a bird that's alive, asking Borden, "Where's his brother?" Sarah telling Borden, "Some days, you love magic more than me." Borden telling Olivia, "Part of me loves Sarah." Borden forgetting that he promised to take his daughter to the zoo (it was actually his twin). Sarah noting that Borden's bandaged hand is bleeding more than it should be (it's his twin, who cut off his own fingers to replicate Borden's injury). Angier hypothesizes that Chung Ling Soo is actually a young man acting as an old man, and is so dedicated to maintaining his act that he acts like an old man even when off stage and in public. This is very strongly related to Borden's secret. Angier's double, Root, is an Englishman playing an American. Not only does the use of doubles (in which one eventually gets hurt) foreshadow the secret of the real Transported Man, but Angier himself is actually an Englishman pretending to be an American. Not only that, but the night the "New Transported Man" went bad, Root talked to Borden in a pub, where he told Root about how he did a similar trick by using a double. Olivia tells Angier that The Transported Man is accomplished by using a double because she found lots of disguise supplies, but that's not the real reason those supplies are important. Very early in the film, Borden states that he can do an astonishing trick, and that nobody else can do it. Revealing the reason why nobody else can do it would be a major spoiler. Not all foreshadowing is foreshadowing the final twist. An example of one that isn't would be early on, a character analyzing the tricks behind the bullet catch trick says the following things: "I mean, someone could stick a button in there! Or, God forbid, a bullet!" And then someone got deliberately shot when doing the bullet catch trick this way. Cutter repeatedly tells Angier that there's only one way for Borden to do The Transported Man. He's right, but Angier refuses to believe it. Genre Shift: While the central story remains a thriller centered around two stage magicians with a bitter rivalry, the setting starts out as a Victorian Period Piece until we see Nikola Tesla's cloning machine, and it becomes Steampunk science fiction. Go Seduce My Archnemesis: Angier to Olivia. One of the first obvious signs that the two are willing to go to extreme lengths to try and defeat each other. Historical Villain Upgrade: Thomas Edison is hinted to be a ruthless, violent man who crushes his foes by sending Faceless Goons to burn down their labs and run them out of town. Even way up in the mountains, Tesla couldn't escape his wrath. In real life, Edison did order a disinformation campaign against AC which involved killing animals and lobbying. How We Got Here: Ignoring the title card, the first actual story-important scenes show Cutter performing a magic trick for a girl, and Angier's final magic trick, with Borden finding Angier drowning, all accompanied by Cutter's Opening Narration. Both events take place near the end of the story and are explained and explored as the film moves along. At the beginning of the film, Cutter keeps telling Borden that the Langford Double knot can't be used in an underwater escape, because if the rope swells, Julia won't be able to slip it while she's in the tank. Julia is confident that she can, so she okays Borden using the knot. Then they both find out that Cutter was right. Cutter was also right about the Transportation trick using a body double. If either of the magicians had listened to him, there would be no film. I Let Gwen Stacy Die: Piper Perabo's character, Julia, who drowns during a stage performance, setting Angier, and also Cutter initially against Borden. In Medias Res: The movie's title card shows a pile of identical top hats, which is a later scene in the film. The scene takes place in the middle of the story, where Angier discovers that Tesla's machine can clone objects, and those are his hats that were cloned multiple times into a small pile. Insufferable Genius: Borden's a fantastic magician, he's just a terrible performer (though he is at least capable of improving when his mistakes are pointed out to him). In the novel it's the other way around, with Borden pointing out several times that Angier just didn't understand showmanship. Angier also trolled magician trade publications early in his career. Jerkass: Borden (the one who gets hanged), and Angier's double, Root. Kayfabe: Adherence to this is the reason for most of Borden's troubles. Killing Your Alternate Self: The machine creates a perfect clone of Angier each time he uses it. Every time he did the trick, however, it was apparently random as to who would wind up in the box and who would wind up on stage. This is highlighted in the final shot of the movie, which depicts rows and rows of water tanks, with a dead Angier in every single one of them.. Lightning Can Do Anything: For Borden's trick the electricity is just for show, but Tesla got it to duplicate things. Lovely Assistant: Olivia Wenscombe is this to both of the stage magicians involved (and has affairs with both of them). Angier's wife was also this. Mad Artist: Angier shows more traits than his rival. In the end he explains that the magic shows' main point (and all that it implied) was to puzzle the audience and be considered the best magician ever. Judging from his popularity it was a complete success, but the price he paid was very high. Magical Realism: Tesla invented a cloning machine, but it's not a big point and is mostly a story device for the central story of a magician rivalry, and nobody treats it as anything more than just "advanced science". Magicians Are Wizards: Subverted: the movie explains every trick, and at one point Cutter snaps "You're a magician, not a bloody wizard! If you want to do magic, you've got to get your hands dirty." Perhaps more specifically, Tesla is the wizard, having created Angier's cloning device. Meaningful Name: Rosalyn and Marilyn Borden were twin actresses who had numerous roles between The '50s and The '80s, meanwhile, Alfred Borden is revealed to be two identical twins at the climax. Misapplied Phlebotinum: Deliberately invoked. Tesla's invention of a perfect matter replicator could be put to many more benevolent and/or lucrative uses than a stage performance. However, Angier only cared about the show and taking on revenge against Borden, and Tesla, aware of Angier's obsession, wants him to destroy the machine to stop him from going too far. The story also deliberately cuts off all further developments by having Edison's men destroying Tesla's lab. Mr. Fanservice: Outstanding performances aside, it doesn't hurt that the two leads are played by the not entirely unattractive Jackman and Bale, with Bowie on hand too. Mundane Solution: Angier originally achieves the Transported Man using a body double, and so do the Bordens, later, he instead uses Tesla's cloning machine to create the illusion of transporting himself when he is in fact cloning and drowning himself over and over. Mysterious Past: In an early scene it's revealed that Angier and Cutter don't know where Borden comes from or anything abut his past before he started working with them. Indeed, apart from the twin revelation, nothing about his life before the events of the movie is revealed. Nested Story: Borden reading Angier's journal, about Angier deciphering Borden's journal. Nice Job Breaking It, Hero! : In the book, Borden shuts off the power to Angier's machine while the latter is in the midst of the In A Flash act. This effectively creates a ghostly version of Angier who is seemingly immortal and more vengeful than before. In the film version, Borden purposely allows his journal to fall into Angier's hands. The journal contains none of Borden's secrets and is intended to send Angier on a wild goose chase, however his discovery of one word within the journal - Tesla - ultimately leads to the creation of the Real Transported Man and his final scheme to bring down Borden. Noodle Incident: The first time Angier shows his version of The Transported Man to the theater owner, the stunned owner starts talking about how rare it is to see real magic, and that he hasn't seen it happen since... well, whatever this thing was that he was going to say when Angier cut him off. Obfuscating Disability: Chung Ling Soo, the ancient Chinese performer who hides the strength required to accomplish several of his tricks by always pretending to be a cripple with stiff legs in public. Once More, with Clarity! : The biggest reveal of all is accompanied by one of these. Oh, Crap! : During Angier's on-stage performance of his disappearing birdcage trick, when two volunteers come up to assist, Angier realizes too late that one of them is actually a disguised Borden. Paper-Thin Disguise: Averted: That Root is the body double for Angier's Transported Man trick is something Borden can clearly see through. People Jars: Angier's many drowned copies of himself, stored in a warehouse. Playing God: Angier creates life. Powered by a Forsaken Child: Tesla knows how twisted his teleporter is, and even tries to warn Angier by letter after it is delivered to him. Pragmatic Adaptation: The novel and the film, barring the premise of "Two rival magicians in Victorian times try to one up each other," are two separate creatures- for one, the novel has a Framing Device of descendants of Angier and Borden meeting in modern day England and going over the magician's diaries. Red Herring: Angier spends a great deal of time deciphering his way through Borden's journal for his secrets, only to find a message from Borden near the end, which explains how he just got him to waste months deciphering nothing. The Reveal: The secrets to both Borden's and Angier's Transported Man tricks. Angier was replicating himself using one of Tesla's machines, then killing his clones by locking them in his water tank. Borden secretly has an identical twin who shares his identity with him. Rival Turned Evil: Both of them. Part of the enjoyment of the movie is trying to decide who has fallen the furthest. Screw This, I'm Out of Here! : Near the end, Olivia wisely decides she's had enough of Borden and Angier's feud and just leaves them both. Serious Business: These people are serious about stage magic. Dangerously serious, in fact. Shout-Out: During Borden's Bullet Catch scene, one of the performers on the list is one Mr. Harry Dresden. Sibling Yin-Yang: Downplayed with the Borden twins. We don't see much of them as individuals, but one is a family man who loves Sarah, and recommends just letting the rivalry with Angier die. Meanwhile the other is more aggressive, loves Olivia, and sneaks into Angier's performance to learn how he performs "The Transported Man". Single-Minded Twins: "Borden" is actually a pair of twins who have made it their life's work to be so identical to each other that no one can tell the difference. The one flaw in their arrangement is that they fall in love with different women. The women they love can also tell some difference. Specifically, Sarah can tell that sometimes Borden genuinely means it when he says he loves her, and sometimes he doesn't. Small Role, Big Impact: Angier's wife. She had only 2 scenes at most, but her death begins the bitter rivalry between Borden and Angier. Steam Punk: You might not expect it, but Tesla, the poster wizard for this kind of genre, built a magical cloning machine from Victorian era technologies. Tesla's assistant's name is Alley. He has a black cat for a pet. An alley cat. The title is unnervingly close to the word "prestidigitation", meaning sleight of hand or magic. The Other Wiki denies a shared etymology, but the phonetic similarities are obvious. The initials of the main characters can be arranged to form "ABRACADABRA" without having to change the order of the first and last name. Fallon is a near perfect disguise on a technical level, since both twin Bordens utilize heavy make-up and mirror injuries to cover up the fact they switch between both identities, but neither twin can quite copy the other, thus allowing the audience on a second viewing to distinguish which twin is which and the trick consistently fails to fool Borden's wife completely. The English Lord Caldlow, on the other hand, pretty perfectly plays himself as the American Robert Angier throughout the film with no clues given to the deception save for one line spoken to his wife, alongside his seemingly inexhaustible funds, thus performing at a higher and more intuitive level than Borden in his disguise. Teleporters and Transporters: The rivalry is focused around who can pull off this magic trick most convincingly. Tesla creates a matter replicator that also functions as one after getting some rather immoral adjustments. The Voiceless: Fallon. Justified because he speaks with Borden's distinctive London accent, and if he was heard using it, that would expose the twins' secret. This Cannot Be! : One of the characters in the end, and arguably the viewer on first watching. Title Drop: Professional magicians see their art as three stages; the "pledge", the "turn", and the "prestige". Twin Switch: Angier and his double, Root. Played even more straight with the Borden brothers, identical twins who swap roles, and the Fallon disguise, without anyone knowing. It works better since with the Borden twins, and with Angier and Root, Jackman and Bale are Acting for Two. Was It Really Worth It? : Both Angier and Borden are confronted by this at the end of the movie, if their obsession with the craft and their rivalry was truly worth it. Borden decides no, definitely not. Angier is unrepentant in his actions. Wedding Ring Removal: During the The Reveal that Borden's having an affair with Olivia, there's a scene where he kisses her while rolling his wedding ring across his knuckles with his free hand. Then again, Borden is secretly a pair of identical twins and only one of them, Alfred, is in love with his wife, Sarah, unlike the other twin Frederick. Wham Shot: Played with: the scene of a field of top hats appears very early in the movie but it isn't until two cats instead of one are running through the field that it becomes clear what exact that image entails. What Have We Ear? : Borden likes doing this. "World of Cardboard" Speech: Angier at the end, which also serves as his Final Speech. White-Dwarf Starlet: Angier's double, Root, is a drunken, arrogant, washed-up Shakespearean. A Wizard Did It: It's never described how Nikola Tesla built a cloning machine. Let's just leave it at "he's one hell of a genius". Xanatos Gambit: Angier killed himself dozens of times so that when Borden inevitably made it backstage, he could be framed for murder on circumstantial evidence. Whether he's the man in the box or the man outside, Borden goes down. However, Angier didn't know Borden had a twin who could avenge him, then take back his daughter. Incidentally, this turns his Xanatos Gambit into a Batman Gambit which was, adequately enough, pulled off by Batman himself, Christian Bale. Also qualifies as a Thanatos Gambit for the Angier clones that end up as the "man in the box."